This isn't the greatest quality photograph, but I liked the subject matter and the inscription on the back. 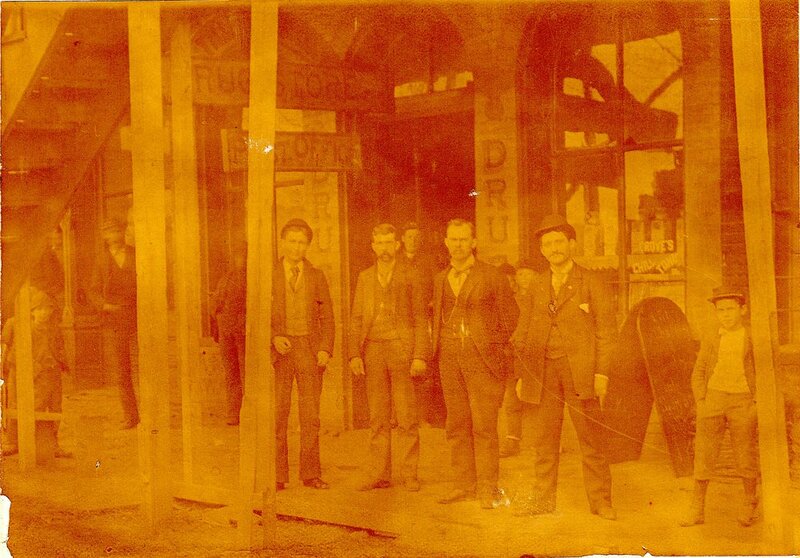 It depicts a group of several men, and a couple of boys, standing in what looks to be a late 1800s storefront. The photograph was taken and printed by the Covell Photo Co. at 448 35th Street, near Dearborn, in Chicago. Other possibilities for the name could be: Moreley, Moresly, Marley, Mareley, etc. The writing is a little difficult to decipher. I did some very quick searching for the photographer and the names, both on Ancestry.com and newspapers.com. Nothing obvious came up after about a 15 minute search. That doesn't mean that it is not there! It just means that it will have to wait until I find some spare time to dig a little deeper (or one of you comes up with something). Here is a copy of the photo with some of the contrast adjusted. And here are some closeups (also with contrast adjusted) in hopes of revealing some clues. What can you tell me about this photography? I want to know everything you can find! Feel free to post a comment below or email me with your findings or speculations: info@psychogenealogist.com.